. Reflective Roofing | Roof Repair Houston | Anchor Roofing Inc.
Reflective roofs are a tried and tested method to increase building energy efficiency, comfort, increase energy savings and also help alleviate summertime urban heat. Reflective roofs function by reflecting sun rays off the roofing surface, instead of absorbing the heat that is transmitted into the building and surrounding neighborhood. The simple act of changing from a dark to a light-colored roof has many advantages, in fact, several roofing companies Houston Texas can guide and assist you in installing a cool roof. Buildings protected by such roofs need less power to cool and assist building owners and occupants save money. Reflective roofs on buildings without air conditioning may also save lives during heat waves by reducing indoor temperatures. Such coatings are common with flat roofs but can be used on steep roofs as well. You can apply Albedo coatings after the roof installation with the sole purpose of reducing solar heat absorption by the roof. Good commercial roofing contractors Houston tx like us will give you the best choices and services for your roof. The roof coating we apply is able to filter UV rays from the sun. UV rays are bad for all roof types and can break down many roof types over time. A commonly used roof coating for flat roofs is bright, white paint. Many of these paints, sold as roof coatings, are classified by the degree to which they reflect the sun’s rays. Other common roof coatings include elastomeric, polyurethane and acrylic paints. Generally, these roof coatings must be reapplied approximately every 5 years, particularly in hot climates. Some roofing materials contain natural resistance to direct sunlight and UV rays. Examples include metal roofs, which act as a mirror to reflect radiant energy from the sun back into the atmosphere. Why Choose a Reflective Roof? Nobody likes to work in a hot or stuffy building. Without a reflective roof, the temperature of many roofs can soar nearly 100 degrees above the real temperature on hot and sunny days. A reflective roof will absorb less heat and keep the interiors of the building cool and pleasant. If you can drastically reduce the temperature on your roof, it will translate into lower temperatures in the attic and lower temperatures overall in your home. Roof experts assess that a cool roof can save at least 20% or more on the cooling costs. During the summer it reduces the amount of the sunlight entering the building. The biggest enemy of most roofs is direct sunlight, particularly the damaging UV rays of the sun. Using light-color paint or a roof coating in a reflective roof that will last longer than roofs without the same protection. Lower peak electricity demand, during a hot summer day which can help prevent power outages. Reduce harmful emissions, such as carbon, sulfur dioxide, mercury, and other dangerous gases by reducing the use of air conditioners in buildings. If your roof is in poor condition or nearing the end of its life cycle, it may be time for a roofing solution that makes financial and environmental sense. 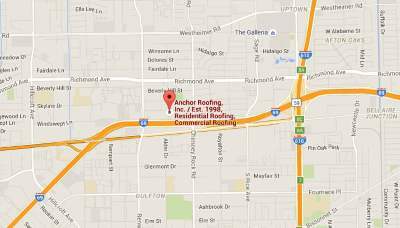 Contact Anchor Roofing today for a free roof estimate. We will help you decide which roofing material and coating is the best for your commercial facility or office complex.